An upcoming LACMA exhibition will bring Guillermo del Toro’s legendary horror collection to the public for the first time. “This morning I woke up in the Dickens room, which is a room that is dedicated to Dickens, and all the furniture is Dickensian and Victorian, and it’s surrounded by books from the Victorian era (…) and I exited through the Nosferatu corridor by pushing the secret painting on the wall into my kitchen.” Guillermo del Toro recently told the HFPA this story to describe his amazing collection. del Toro calls his museum house Bleak House after the Charles Dickens novel and up until this year his extensive collection was one of the most hidden and exclusive places in Los Angeles. A private place that the Mexican director nicknamed "El Gordo" (fat one) by his friends, has been built up after years of collecting eclectic objects: a full scale replica of Frankenstein and his bride; Ray Harryhausen's Jason's Argonauts standing in the garden; a bust of Megan from The Exorcist glued to the TV set. And that barely scratches the surface. A walk through the individually themed rooms reveals Del Toro’s extensive library of millions of books collected by this true lover of comic books, TV, science fiction and horror literature (or simply every book that deserves to be read). Del Toro keeps them all in rooms named after authors he reveres (like the Dickens room) or chambers where it's always raining, unlike his adopted city of Los Angeles, where it seldom rains. Those few lucky enough to have crossed the threshold of Del Toro's paradise of “reason and madness” have been flabbergasted by this living museum, an amazing catalogue of the most vivid fantasies of today's pop culture. 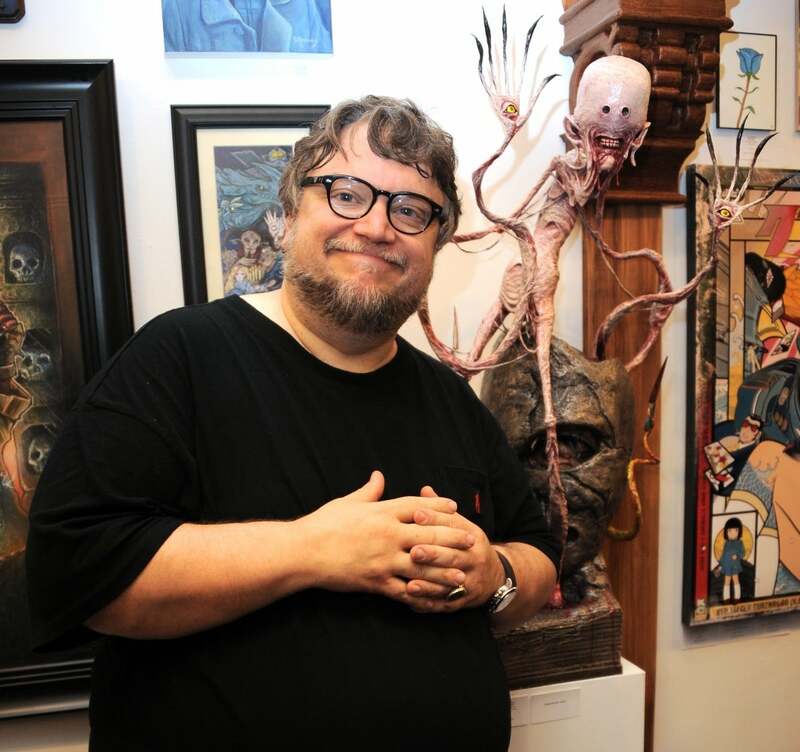 So it will be a dream come true when the doors to his personal collection open to mere mortals next July as the Los Angeles County Museum of Art ( LACMA) presents a comprehensive exhibit dedicated to Guillermo del Toro. "An exhibit of my movie stuff!” confirmed the Guadalajara-born artist. The exhibit will be a showcase of more than 500 pieces culled from his collection at the Bleak House. According to Del Toro, the show will remain on view at LACMA between July and November and after that it will go on tour, starting in Minneapolis and followed by Toronto, Mexico City, Barcelona, Paris, and finally New York City. The exhibit is a testament to the wide reaching passion of the director of Pacific Rim, Crimson Peak, Hellboy, Pan's Labyrinth, and Cronos. A restless creative soul, Del Toro has tried his hand at TV productions like The Strain, adapted from the novel he wrote with Chuck Hogan, and he has produced the DreamWorks animated series Troll Hunters. Del Toro is also preparing a literary adaptation of his film Pan's Labyrinth with the German fantasy author Cornelia Funke. In 2013 Del Toro supervised the book version of his Bleak House publishing Guillermo del Toro Cabinet of Curiosities: My Notebooks, Collections, and Other Obsessions, a volume that showcases a big part of his art collection, musings and pieces that inspire him and feed his imagination. Talking with the Hollywood Foreign Press, del Toro confided that his Bleak House is the best representation of who he is. "It happens to all of us, our house is who we are. Even if people say not to judge a book by its cover, we are what we own. And I know the difference between collecting or accumulating is very, very, very small. A hoarder accumulates compulsively while the collector lives through their objects, every book, every object has a meaning. And that's me," he said. Guillermo del Toro's exhibition follows in the footsteps of another great collection that is still touring the world to honor one of the greatest visionaries in contemporary cinema, Tim Burton. The massive success of Burton's exhibition, that started its run in New York's MoMa in 2009, inspired this exhibition, dedicated to this irrepressible Mexican who along with his friends, Alfonso Cuarón and Alejandro González Iñarritu, is revolutionizing contemporary Hollywood.